The NOOK Tablet comes with e-mail that lets you send and receive from most other e-mail programs: an account you have set up on your own or a web-based e-mail service like Gmail. Sending a message is very simple. Tap the pencil icon in the upper-left corner. Type an address in the To box. Or you can tap the Contacts icon and choose an address. Separate additional names with a comma. If you’ve set up more than one e-mail account, you can switch by tapping Account (at the top of the E-mail screen). Choose the inbox for the account you want to check. You can also select Combined Inbox to see all messages from all established accounts in a single listing. You can also attach a picture, video, or audio file. Open the NOOK Email app. Tap the gear icon next to the account you want to configure. In the General tab, tap the Signature line’s down arrow there. Edit or delete the text you find in the Signature block. Type the e-mail addresses to send the message to. You can add a note of your own, like “This is the funniest joke I’ve ever heard.” The original subject line goes along with the message, along with Fwd:. You can edit the subject if you’d prefer. The NOOK Tablet e-mail panel shows unopened messages in bold. To get rid of a message you have open, tap the Delete button at the bottom of the screen. Tap the check box next to the message(s) you want to delete. Tap the trash can icon at the upper-right corner of the screen. We use our high-tech computer tablets to send photographs of the grandchildren, video clips of cats stuck in shoe boxes, and singing birthday cards. Most of those are sent as attachments to e-mails, which means you’re sending a separate file along with the text of a message. If you get a message with attachments, tap the View Attachments button. The NOOK Tablet can work with PDF files or Microsoft Office word processing, spreadsheet, and simple PowerPoint files. 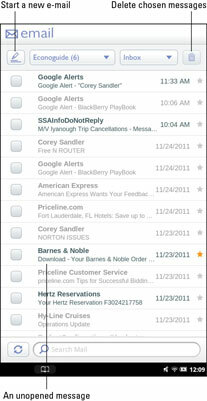 The NOOK will store e-mail attachments in the MyFiles/Downloads folder. In the first release of the operating system for the NOOK Tablet, you can receive attachments but cannot send them. This oversight may be fixed in later updates.